Pamper yourself with onsite massages or enjoy recreation amenities such as bicycles to rent. Additional amenities at this hotel include complimentary wireless Internet access, concierge services, and babysitting/childcare (surcharge). Guests can catch a ride on the shuttle (surcharge), which operates within 6 km. Make yourself at home in one of the 24 air-conditioned rooms featuring minibars. Rooms have private balconies. Complimentary wireless Internet access keeps you connected, and satellite programming is available for your entertainment. Private bathrooms with showers feature complimentary toiletries and bidets. Enjoy recreation amenities such as bicycles to rent or take in the view from a garden. Additional amenities at this property include complimentary wireless Internet access, tour/ticket assistance, and barbecue grills. With a stay at Il Faro della Guitgia in Lampedusa, you'll be on the beach, within a 15-minute drive of Rabbit Beach and Guitgia Cove. This beach hotel is 0.3 mi (0.5 km) from Fisherman Statue and 0.5 mi (0.8 km) from Cala Croce Beach. Make yourself at home in one of the 23 air-conditioned rooms featuring minibars and flat-screen televisions. Complimentary wireless Internet access is available to keep you connected. Bathrooms have showers and hair dryers. Conveniences include phones, housekeeping is provided daily, and you can request cribs/infant beds (complimentary). Located in Lampedusa, Il Villaggio del Mago is within a 15-minute walk of Creta Cove and Cala Pisana. 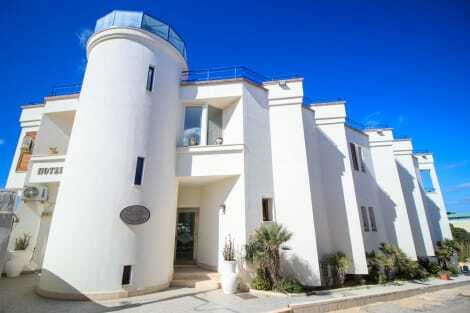 This guesthouse is 4.7 mi (7.5 km) from Rabbit Beach and 0.7 mi (1.2 km) from Parish of St. Gerland Lampedusa. lastminute.com has a fantastic range of hotels in Lampedusa, with everything from cheap hotels to luxurious five star accommodation available. We like to live up to our last minute name so remember you can book any one of our excellent Lampedusa hotels up until midnight and stay the same night.